Providence, RI — Despite December data that showed large losses in both jobs and employment, Rhode Island’s 48th rank remained unchanged on a broader measure of overall employment opportunity. This according to the RI Center for Freedom & Prosperity, which noted that the massive exit of 2,200 people from the state’s labor force, which illogically lead to an improved unemployment rate, is actually a negative factor that helped keep the Ocean State stuck at third-worst nationally in the Center’s December Jobs & Opportunity Index (JOI). The state’s weak JOI score (which slightly improved in December to 17.9 on a scale of 0-100 from its November score of 17.6) parallel findings from another national study, the Family Prosperity Index (FPI), where Rhode Island ranks 43rd overall in “economics” and 44th and last in New England in “entrepreneurship”, which can be largely attributed to an overly burdensome governmental regulatory and tax regime. A more detailed analysis of the December data, specifically on employment and jobs, can be found on The Ocean State Current, the Center’s journalism and blog website. The unexpected job and labor force losses erased most of any gains the state saw in 2016. 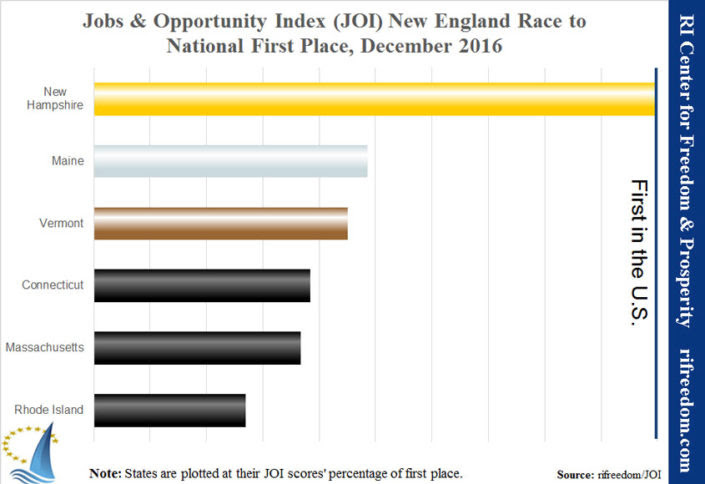 Supporting the findings of the JOI metric, Rhode Island also ranks 48th in the Family Prosperity Index, the broadest national measure of family well-being.